This invention provides a fast, reliable and nondestructive method of determining sugar content during the harvest of sugar beets. 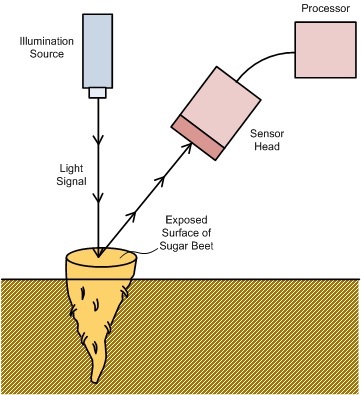 This on-the-go sugar content sensor, developed at North Dakota State University, uses optical technology in combination with intelligent information processing techniques to provide sugar content information in real time as the sugar beets are being harvested. By combining the sugar data with the yield information, the producer has unprecedented, site-specific accuracy. Reliable sugar content readings created as the beets are being harvested. Combined with yield mapping techniques, provides accurate site-specific mapping of sugar content. This technology is patented (U.S. Patent No. 6,624,888) and available for exclusive licensing/partnering opportunities.